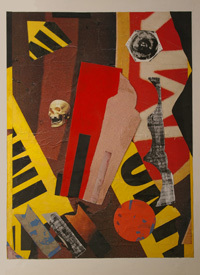 TransVagrant and Warschaw Gallery are pleased to present CLOSE AT HAND, COLLAGE by William Mahan. Mahan is primarily known for large scale works abstracted from real-life places and events and painted with Guston-like directness – sophisticated in color and drawing and blunt in facture. The collages comprising CLOSE AT HAND represent a departure from the conceptual calm and physical assertiveness of the paintings. Composed largely of billboard fragments scavenged over years from the studio roof and punctuated by images close at hand, they represent the harsh realities of postmodern existence. Mahan received his BFA from the Massachusetts College of Art and his MFA from the University of Illinois and has been the recipient of a National Endowment for the Arts Grant. His work can be found in many public and private collections including the Krannert Art Museum, University of Illinois, California State University, Long Beach, Atlantic Richfield Corporation, and the Security Pacific National Bank Collection, Los Angeles. Curated by Ron Linden, CLOSE AT HAND runs through December 31. For visuals or additional information please call 310-600-4873. Gallery hours are Monday – Saturday, 11 AM – 6 PM. This exhibition funded in part by generous support from the Community Redevelopment Agency of Los Angeles, CRA/LA.